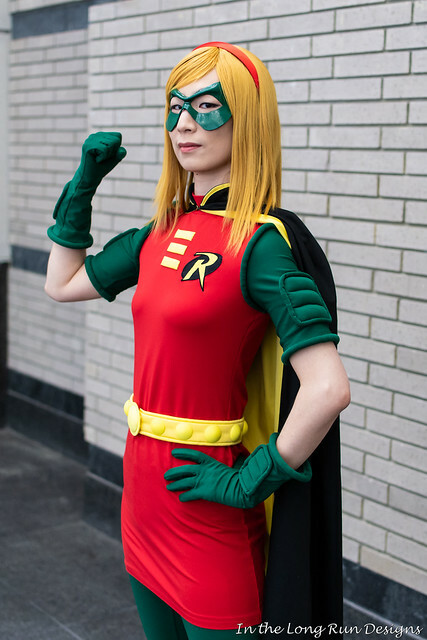 On Sunday of Awesome Con, I decided to wear an older costume, my Stephanie Brown Robin. I had last worn it to PAX East in 2015, so I thought it was time to bring it out again. For this wearing, I fixed up the belt and made a new mask. On Saturday of Awesome Con, Maggie and I decided to both wear Outlander costumes. We had planned to do that last year, but it fell through. When I posted our plans on Facebook, I found out that Rebecca was also going to wear an Outlander cosplay that day, so I arranged a meetup for us three to do photos with Mike. The afternoon light was a bit strong, but Mike made the best of it by strategically angling us with the sun at our backs. 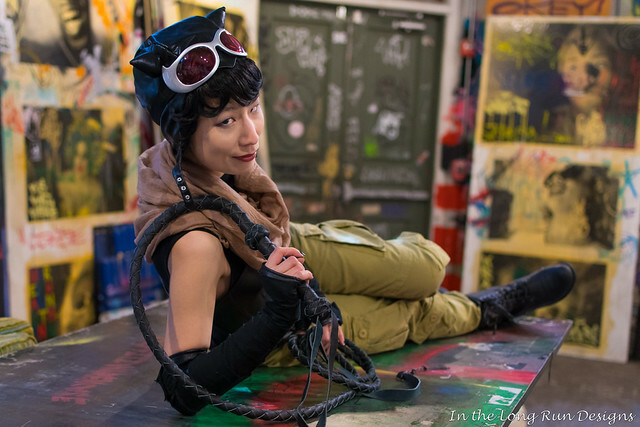 On Friday of Awesome Con, I wore my DC Bombshells Catwoman cosplay for the first time. To be honest, I hadn’t originally planned on finishing this costume for Awesome Con. I had started it on a whim when I had a quiet weekend earlier in the winter, and I had no firm plans or expectations. But then Jamey said she was trying to finish a DC Bombshells Black Canary for Awesome Con, so I decided to make a push as well. I was on a busy project at work at that time, so I cut my sewing close. I was putting the final stitches in my gloves on Friday morning. However, it all worked out in the end! I started out the day by taking a few photos with Mike. Gave us both a chance to warm up before shooting with others later. Mike and I saw a lot of excellent cosplayers at Awesome Con this year. Since the convention is pretty open in terms of theme, there is always a really large variety of fandoms represented, which I love. You can find something for everyone. On to the photos. I’ll start with the ones that Mike took of me (and I edited), followed by ones taken by other photographers. Mike and I started by working in the ground floor room of the warehouse, which has lots of cool graffiti, but is also pretty dark. We had to be creative to get decent lighting. Mike had me get up on a metal countertop facing the center of the room. He said he wanted to try a “draw me like one of your French girls” pose. I was skeptical it would work. Hence this face. But I have to say, it did work! 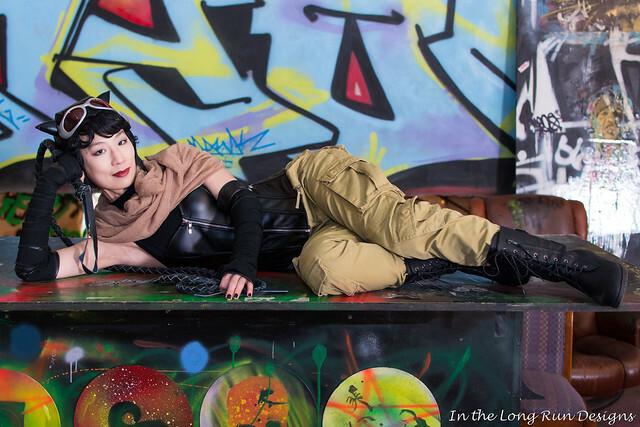 In March, Mike and I were able to attend another D.C. Cosplay Photo Shoots meet up. The location was the Graffiti Warehouse in Baltimore, which is a really cool artist space with lots of graffiti murals both inside and outside. The theme was “Grit,” meaning rough-and-tumble or post-apocalyptic characters. However, due to a busy local cosplay schedule (Katsucon was just a couple weeks beforehand), cosplayer signups were on the short side, so the theme ended up being expanded to anything that would fit with the location. I invited Maggie along because I thought she would enjoy participating in a D.C. Cosplay shoot. She wore her beautiful Violet Baudelaire costume (from A Series of Unfortunate Events). 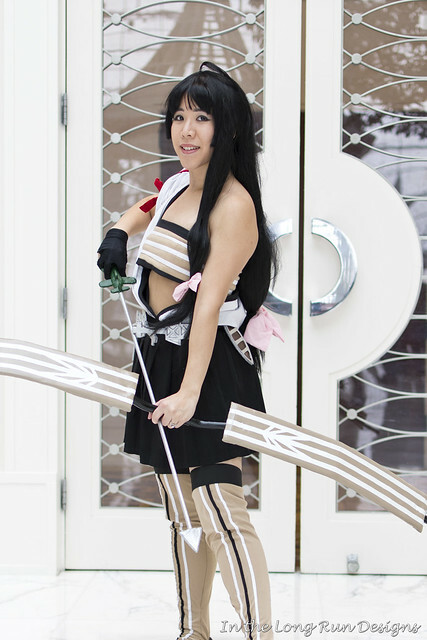 This post is about the photos that Mike took of other cosplayers (and I edited). I’ll follow up with a post on photos of me later. This was my first time editing in Lightroom, as Mike and I finally decided to upgrade from Adobe Bridge CS5. It took a little getting used to, but a lot of the basic layout and tools are similar. Plus, it gave me the opportunity to play around with some Scott Kelby presets, which I had wanted to do for a while. 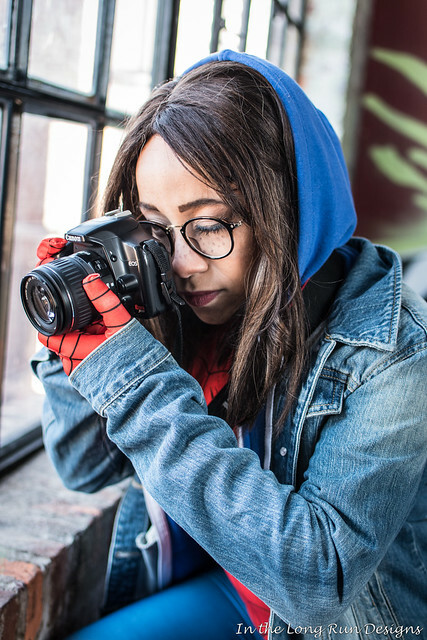 The first cosplayer that Mike worked with was Lily of Cool Beans Cosplay, as fem Spider-Man. I love her costume, especially with all the colors and textures. The Blue Valley Vineyard and Winery was a lovely location for a shoot, but, because it was January, we had the challenge of harsh winter sun outside. I was interested to see what each photographer was able to do with it. The solution that Mike and I came up with was to shoot with the sun almost behind me, coming across my left shoulder. This gave a pretty halo effect, but I had to be careful about which way I turned my head and body to avoid dappling. I like the results! 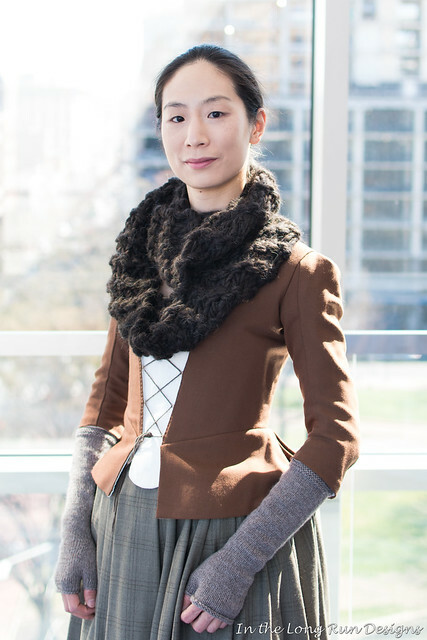 I wore an older costume, which was actually only my second 18th century ensemble. I made the jacket back in 2012 for the first Francaise Dinner, and I had not worn it for several years. 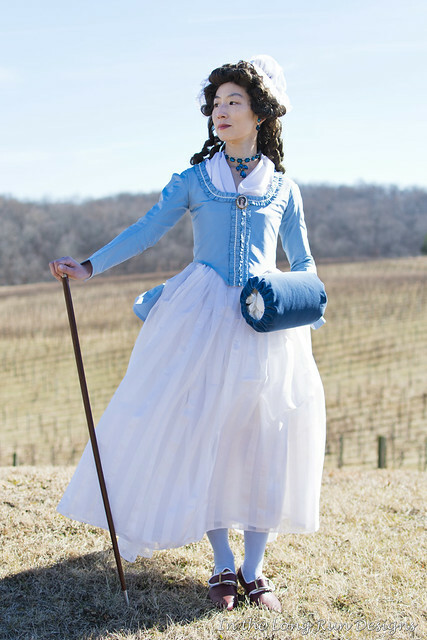 The jacket is hand sewn from ice blue silk taffeta purchased from Renaissance Fabrics. I only needed two yards. (My blog posts on the construction are here.) I accessorized with a cap from Fashions Revisited, a walking stick from Colonial Williamsburg, a velveteen muff, and jewelry that I made (similar pieces are available in my Etsy shop). My shoes are by American Duchess. I’ll start with the photos that Mike took and I edited. Again, we were working with some harsh directional light, but I think we made the best of it. We have this awesome group here, called D.C. Cosplay Photo Shoots. They organize one to two meetups each month where photographers and cosplayers get together to shoot photos. Each time there is a theme that fits with the chosen location. The photographers maintain the commercial rights to the photos, but they must provide two images free-of-charge for each cosplayer that can be shared online. It’s a really neat format, and has given me and Mike the opportunity to meet a lot of great local cosplayers and photographers. The January theme was “Regality Through the Ages,” meaning historical or couture/detail-driven cosplays. We met at a nearby vineyard, Blue Valley Vineyard and Winery, which had a variety of great backdrops, both inside and outside. 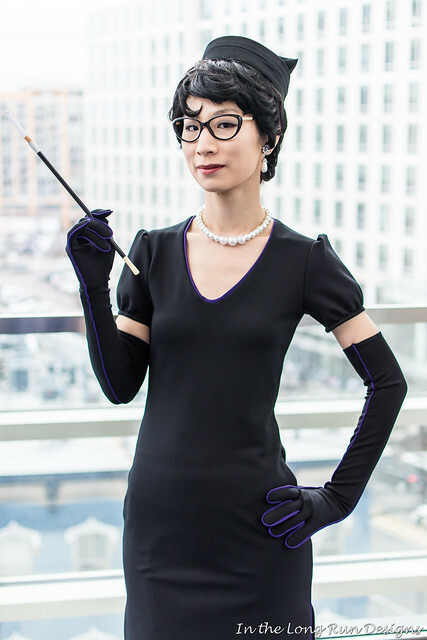 This post deals with the photos Mike took of other cosplayers (and I edited). I’ll follow up with photos that were taken of me. 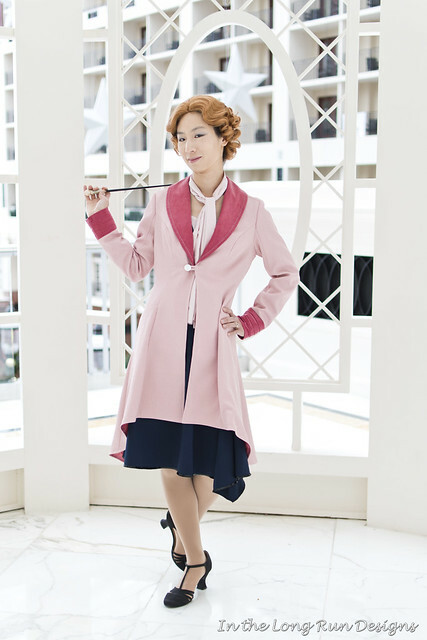 NatArchaic Cosplay as Fleur Delacour from Harry Potter. She really knows how to work great poses! As a four-day convention, MAGFest is a bit of a cosplay marathon. I did a different costume each day, plus Mike cosplayed on Saturday. That’s a lot of things to clean, iron, and prepare. (I don’t know how some people do two outfits a day!) On Thursday I wore Queenie Goldstein, Friday I wore Mulan, Saturday I wore DC Bombshells Batwoman, and Sunday I wore Princess Luna. Mike wore Garfield the Deals Warlock on Saturday. Nothing new for either of us, as I was very busy at work and did not have time to make another costume. The Gaylord National Resort and Convention Center provides a lot of interesting places to take photographs. There are areas with bright white marble (the “Katsucon Gazebo”), other areas with trees and flowers, and lots of textured walls (stone, carpet, swirls, etc.). Mike and I took a ton of pictures. Also, due in part to the location, a number of other cosplay photographers were there, which meant I could work with several throughout the weekend. As both a cosplayer and a photographer, I appreciated the opportunity to see how others approach convention photography. It makes shoots a fun learning experience. Here’s our roundup of hall photos from MAGFest. 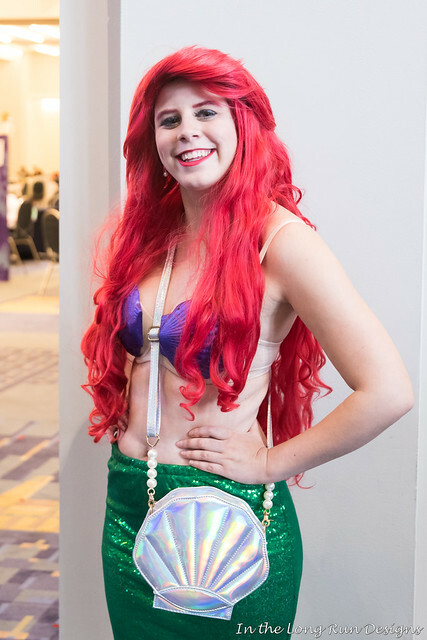 There was a lot of great cosplay this year, driven in part by the Gaylord National Resort and Convention Center being a wonderful backdrop for photos. We’ve been going to MAGFest for three years, and each time there seems to be more and more cosplayers. I’m okay with this trend!